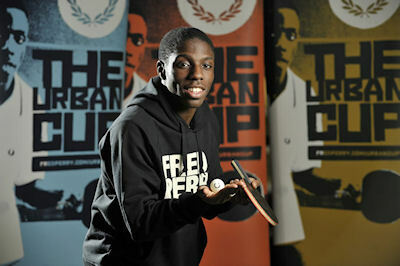 Darius Knight is one of England's top table tennis players. Darius was born in London on 22 February 1990 and is ranked at number 2 in England, just behind his friend Paul Drinkhall. He also has a European ranking (under 21 years) of number 10, a World ranking (under 21 years) of number 39, and a senior World ranking of 287. Darius is definitely a young player with plenty of promise. On 28 January 2010, I caught up with Darius Knight and managed to ask him a few questions. Please tell us about your own web site. My website www.dariusknight.com was in the planning stages for a few years, but I never really got it off the ground as I was so busy. It's now done by a close friend of mine who grew up with me over the years. It hasn't been updated recently but I've been nagging him to do it. Can you tell us about your sponsors and how they help you? Well currently I'm sponsored by Fred Perry. In the past it has been VISA and a few others, but now it's solely Fred Perry. They help me financially to pay for competitions in the UK and outside of the UK! I get amazing clothes, from the casual and sporty, and every year we have the Fred Perry Urban Cup which gives back to table tennis in my and their own way with the English Table Tennis Association helping thousands of kids to play from all parts of the UK. A lot of my readers are very interested in what equipment the top players use. Can you tell us what blade and rubbers you use and whether you experiment with using different blades and rubbers? I'm currently using the Butterfly Timo Boll Spirit blade and Butterfly Tenergy 05 red and black rubbers. But at the minute I'm trying to change to something a little bit less fast with a softer feel. So right now I'm waiting for the perfect blade to use by a team mate or someone who has a spare one. Can you tell us a little bit about your training programme? Well basically I train Monday to Friday. I have a coach called Liu Jia Yi. He is chinese. At 08:45 hours I do core body work 3 times a week and agility 2 times a week. We do this for about 30 minutes in the morning. After that we start to warm up at 09:30 hours and finish anytime around 12:30 hours. At the start of training we do a lot of footwork exercises, mainly with our forehand. Practice at the moment isn't very ideal as many of my practice partners are away playing for their club teams. We are not often all there at the same time but we try to play with different players from our group, such as Paul Drinkhall and Chris Doran. Have you made any instructional/coaching videos/DVDs that we can buy? If not, is this something you may do in the future? No I haven't done any of this yet because I feel I am not one of the best in the world yet, so I can't be offering official table tennis help when I'm not there yet! As there are table tennis events all year round, can you give us an insight into how you prepare your schedule each year? My timetable I know, but at the same time it's pretty random. It's very hard to train for something when you have club matches every week. Almost every week from September to May there are club matches. Normally for the majors we have a lot more time to prepare. I feel that's when I play better so it's quite hard to find the balance when you're young. Also fitting in the Pro Tours can be a difficult job. Many of my readers ask me whether professional table tennis players earn a reasonable income. What are your views on this, and what are your views on the level of prize money available? Can you also give us an indication of how a top professional table tennis player earns his money? 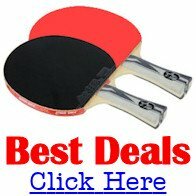 In your experience, what level of world ranking do you need to achieve to be able to make a living from playing table tennis? It depends how lucky you are with sponsors. I know in my position I make a little bit of money, but then it goes back into table tennis - whether it's going to China, buying running shoes or other things. All these little things add up. Some of my expenses are taken care of, so maybe someone who makes £5,000 in table tennis is like £7,000 for a person with a normal job - because a lot of the time my travelling is catered for. And once you are playing for your country, it's the national teams job to look after you. That also happens when you're playing for a professional table tennis club. But it also depends on their policy. It's said that if you're ranked top in the world, money isn't a problem as you possibly may get money from your equipment supplier, money from your club, national team and olympic committee. Personally I think the level of prize money is not the best in England. For example, in a grand prix event, sometimes even if you win, you just about gain. That means just a few pounds. It's hard to say what world ranking you need because every country is different. But for a good living I would say anything from 100 or better, depending on where you are from. World ranking is important when negotiating club contracts, as it's proof of your playing level. But then you will get some players who don't have a great world ranking but can always deliver in club matches. But for how hard the sport is, and everything that's involved, I think it's definitely nowhere near enough money, especially if you compare it to football, tennis, rugby or any of those kinds of sports. What do you think about the current state of world table tennis and what do you think should be done in order to make the game more popular? Do you think that any rules need changing? Do you think that there are too few or too many events and tournaments? I don't think the rules need to be changed because in the last few years there have been more changes than anything. I think in the UK there was a drought for so long that it became less popular. But now we have a group of young players coming along which always helps the popularity. I think that there are too many events, but I would prefer to be active rather than there to be nothing. I think to grab people's attention it should be named after things - like the Ryder Cup in golf. We have the European Champions League, those kind of things. There would be so much interest from the public if they saw a Ryder Cup of table tennis, with tension on each point or set. To get people interested in table tennis, we should almost have the same set up as tennis. Take a little idea from each sport. It also helps how good the country is at table tennis. Good marketing also helps a lot! What do you think about the current state of table tennis in England? Is there a good structure in place? I think it has improved over the last 5 years. England players have won European titles at Cadet and Junior level in 2005, 2006, 2007 & 2008. As well as myself, Paul Drinkhall, Gavin Evans and Liam Pitchford have all won gold and silver medals at these events. Paul Drinkhall and I also won gold & silver medals at the ITTF World Junior Circuit in 2007, and Paul Drinkhall was the World Junior Championship silver medallist in 2008. We also won bronze medals at the Commonwealth Games. The England men's team has just got into the top category in the European mens. We are the youngest team by a margin. But we don't have any top World ranked England players to follow like the Germans and French do! I don't know if there's a good structure. If there was, we would have more players like us. I'm not too sure. I'm not saying there isn't, but France is a country that continues to produce young players every year in the Juniors and Cadets. I think that's a start. It takes some or most young players a few years to break into the seniors and really start to do something. As everyone who follows table tennis knows, the Chinese players currently dominate the world rankings. What do you think about China's dominance? I think that what's important is that the Chinese have a good system to always produce players. There are not too many rules. If you want to play table tennis you just do it. There are centres in every city, not just for table tennis, but for all sports. In the UK there isn't anything like that at all. So the competition becomes tougher. And if you're representing the country, it's only the best of the best who are selected. Also they have a good understanding for table tennis. Not like in the UK. Their mentality is a little different. For most of them it's a different life ... a better life ... so they are not going to let that chance go by. It's all or nothing. Finally, which of your table tennis achievements have given you the most pleasure so far and what are your goals for the next few years? Probably winning my first National singles title (junior) as it took me so long - but there was strong competition. I was the England Junior National champion in 2008 and 3 times Under 21 champion. Also, winning European Cadet silver medal, European Junior bronze medal, plus European Junior doubles gold medal with Paul Drinkhall. Winning European Team event at both cadet and juniors, youth olympic doubles gold, team silver and singles 4! This year my goal is to try and get my world ranking into the top 150-200. I appreciate you taking the time to answer my questions.